I have two traditions that I keep year after year on Thanksgiving weekend. One is baking a homemade pumpkin pie, and eating it for days after the holiday. And the second is making sure to donate to a hunger-related charity at some point during a holiday weekend in honor of food. I know that many people take a moment to be grateful for what they have, and I think that's great. But, I think we can all do better than that. There are even people that go the extra mile and volunteer in a soup kitchen, but that's not feasible for everybody. This is one time that logging on to a website and posting a $25 donation isn't a lazy form of support. It's exactly what you should be doing in between online shopping, wish list making, and eating leftovers. There are so many charities to choose from locally and nationally. In NY, I normally donate to Meals-on-Wheels, or the Foodbank of NYC. But if you're not sure where best to donate, you can always check CharityWatch or Feeding America for suggestions and a rating system on good organizations devoted to hunger issues around the country. It's something small that everyone can do between other less-than-ideal traditions such as, stampeding chain box stores and gorging themselves on food till they fall asleep. Feeling grateful for all that you have shouldn't end with navel-gazing at how content you are with your own life, but really extend into giving back just a little, because people going hungry in this country does not have to happen. 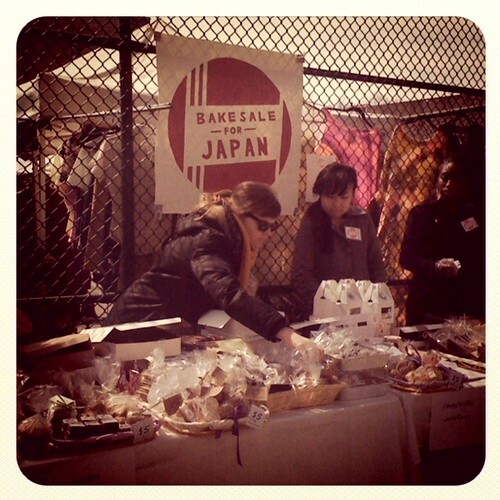 Last Saturday's Bakesale for Japan was a huge success. It took place in cities around the country and together we raised a lot of money. A lot. Like $124,000 lot. I have always believed in the power of sugary goods. Preheat oven to 375 degrees Fahrenheit. Butter and flour madeleine pans well. Melt butter and set aside to cool. Beat eggs and sugar in a large bowl with an electric mixer till blended. 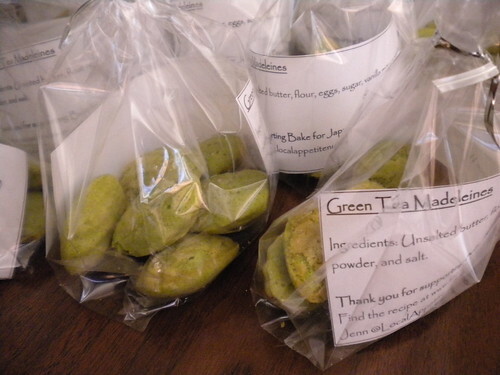 Beat in vanilla, 1 teaspoon matcha powder, and salt. 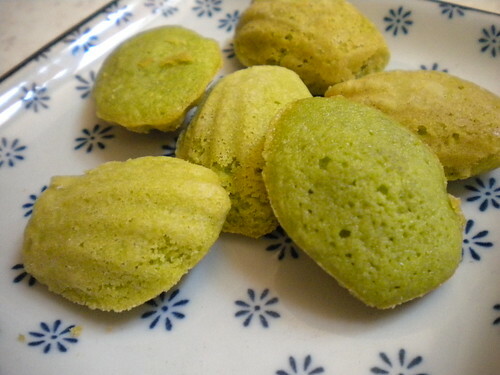 Add additional half teaspoon of matcha till batter is desired color. Add flour and beat until just blended. Gradually add cooled melted butter to mixture, beating until just blended. Spoon one tablespoon (or teaspoon if making mini-sized) of batter into each cake shell. Bake until puffed and edges are lightly golden, about 12-15 minutes (4-5 minutes for mini-pan). Cool in pan for 5 minutes, then remove from the pan and finishing cooling on a wire rack.